If you haven't discovered yet, I LOVE marshmallows! I love all things sugary: cotton candy, candy, cake with lots of frosting but most of all marshmallows! 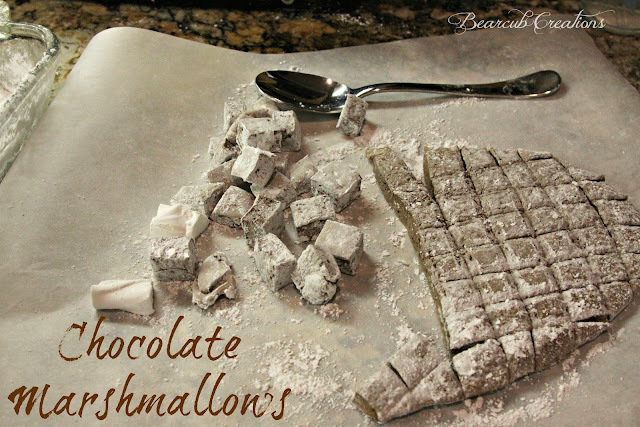 I figured it was time to share my Chocolate Marshmallow Recipe with you and I hope you enjoy. The whole idea for the name Bearcub Creations came from my homemade marshmallows that my husband dubbed "Bearcub Marshmallows." Now 4 years later, I have this little blog inspired from that very time! With a sieve or powdered sugar duster, generously dust an 8 by 12-inch nonmetal baking dish with confectioners' sugar. You may want to lightly spray your baking dish with cooking spray to help the powdered sugar to stick to the pan. Combine the gelatin and 1/2 cup of cold water in the bowl of an electric mixer fitted with the whisk attachment and allow to sit while you make the syrup. It will look like this. With the mixer on low speed, slowly pour the sugar syrup into the dissolved gelatin. Put the mixer on high speed and whip until the mixture is very thick, about 15 minutes. When the mixture has mixed for 15 minutes, it will be thick and stringy. Add the vanilla and cocoa powder, mix thoroughly. 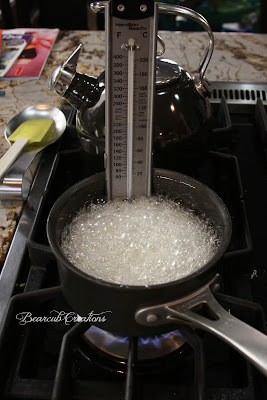 It will change the consistency slightly but don't over whip. Pour the marshmallow mixture into the pan, smooth the top. Tip: Water is your best friend during this step. Your marshmallow mixture will be very sticky and the water will help the mixture to not stick. I use my hands for this step. Allow marshmallows to sit for about 8 hours or over night. Then cut into 1 inch strips. It is helpful to cover the scissors or pizza cutter coated with powdered sugar. Dust all sides of the pieces so that they don't stick. Marshmallows will last a LONG time but store best in an airtight container. I hope you enjoy this little twist on a classic!